Minneapolis, U.S- Around 4,800 nurses began striking at 7 a.m. Sunday at five Minneapolis-area hospitals over a change in their contract regarding insurance. Mary Turner, the president of the Minnesota Nurses Association, said the strikes will take place outside each of the five hospitals affected. There will be 12-hour demonstration each day during the week. The dispute is due to Allina Health’s decision to imposed the union nurses to a new health insurance plan which carries highers individual costs but lower monthly premiums. This plan is the same one over 30 thousand Allina employees and their families enjoy. Allina declared that changing the unique health plan for the union to a corporate coverage will make the nurses and the company to save money on premiums. With this change, Allina Health is reducing its health costs to $10 million per year. The company says nurses visit the emergency room 28 percent more often than other of their employees. Nurses are vulnerable to infections and other health problems, and they need a secure and convenient health insurance to fight these work risks. Nurses go to the emergency room mostly because they work nontraditional shifts that keep them from going to health centers during business hours. Thus, they go to the emergency room. Allina Health pays the total premium for its employees, and because the corporate coverage has low premiums, the company has a winning situation. But this is not the case for all the nurses. Some of them could be saving money, but some others could be facing a cost increase. It all depends on their personal situation. How are hospitals in Minneapolis facing the one-week strike? Allina is compensating the strike with nearly 1,500 replacement nurses to keep their facilities operating. The company has hired three staffing agencies to find nurses. Not all nurses are local, and the Minnesota Board of Nursing has received a significant number of out-of-state licensure applications. The number of claims doubled in the first six months of this year. The last major Twin Cities nurses strike was in 2010. Almost 12,500 nurses were part of the strike and demonstrated in front of 14 hospitals. The union opposed to a new hospital plan that would make nurses vulnerable to changes from one department to another. But the 2016 strike will be handled differently than the one in 2010 when hospitals had to reduce their capacities. Allina said there will not be a drop in their services, and the company added that they will run its facilities almost at full capacity during the week, but some elective procedures may be canceled. 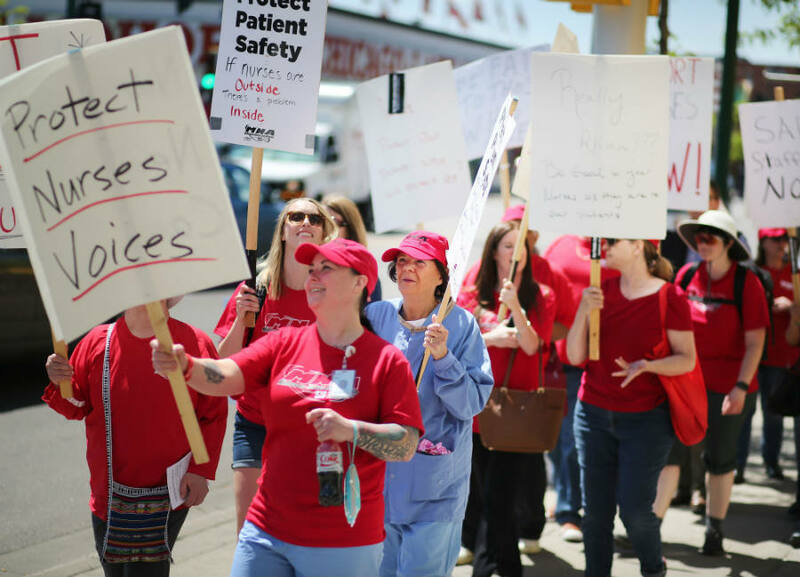 The Minnesota Nurses Association said the strike would conclude at 7 a.m Sunday, June 26.